One of the biggest barriers to effective leadership communication is a lack of time and consistency. If you rely on ad hoc or reactive communication, your team will receive disjointed information and won’t get a clear and consistent picture of you as a leader. That’s why a communications plan is so important – it gives you consistency and consistency is key to effective leadership communication. Consistent messaging, delivered through consistent channels, with consistent cadence helps you consistently reach and connect with your stakeholders. They will come to expect your communication and this helps to build credibility and trust in you as a leader. 1. WHAT: is your key message? What is the central idea that you want to convey or the main points you need your audience to know and understand? 2. WHO: is your audience? 3. WHY: are you telling them? What is purpose of your communication? What goal or objective are you trying to achieve? What response, action or reaction do you want from your audience? 4. WHERE: will you deliver your messages? What methods or channels of communication will you use to reach your audience? Try to consider a combination of online and offline, formal and informal channels. 5. WHEN: and how often will you reach out to them? Make sure you factor in the best time and frequency for your audience, not just for you. 6. HOW: will you measure success? What feedback mechanisms do you have in place to confirm your audience has received, interpreted and understood your communication? Remember, like all plans, you should consistently review and refine your communications plan to ensure it stays relevant to both you and your audience. 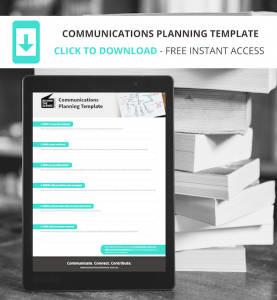 Don’t let inconsistent communication be a barrier to your success as a leader – DOWNLOAD your communications planning template below!